John F. Germ is board chair and chief executive officer of Campbell and Associates Inc., consulting engineers. 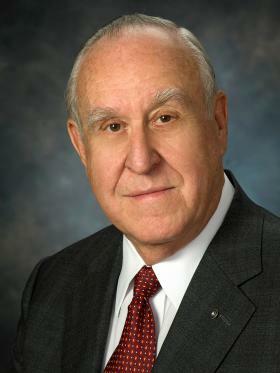 He joined the firm as an engineer in 1965 after four years in the U.S. Air Force. He serves on the boards of several organizations, including the board and executive committee of the Public Education Foundation, Orange Grove Center Inc., and as board chair of Blood Assurance Inc. He also is founder and treasurer of the Chattanooga State Technical Community College Foundation and president of the Tennessee Jaycee Foundation. He was Tennessee Young Man of the Year in 1970; Engineer of the Year, 1986; Volunteer Fundraiser of the Year, 1992; and Tennessee Community Organizations Volunteer of the Year, 2009. He is a recipient of the Boy Scouts Silver Beaver Award and the Arthritis Foundation Circle of Hope Award. In 2013, the White House recognized him as a Champion of Change. Germ joined Rotary in 1976 and has served Rotary as vice president, director, Foundation trustee and vice chair, aide to the Foundation trustee chair, chair of Rotary’s US$200 Million Challenge, RI Board Executive Committee member, RI president’s aide, Council on Legislation representative and chair, membership zone coordinator, chair of numerous committees, area coordinator, RI training leader, and district governor. Germ has received RI’s Service Above Self Award and The Rotary Foundation’s Citation for Meritorious Service and Distinguished Service Award. He and his wife, Judy, are Benefactors and members of the Arch Klumph Society of The Rotary Foundation. They have four children and six grandchildren.